In 2015 there will be two new carriers and as many as 19 new health plans available on New Jersey's Affordable Care Act insurance exchange. But don't expect the new competition to reduce health expenses. An I-Team/ProPublica analysis found many current health plans are increasing premiums or out-of-pocket costs for New Jersey patients in 2015. Rising health premiums have been an expected phenomenon for decades, but it was hoped that competitive incentives in the landmark health law, also known as Obamacare, might slow the growth in prices. In 2014, there were just three New Jersey insurance carriers offering plans through Obamacare: Horizon Blue Cross Blue Shield, Health Republic of New Jersey, and AmeriHealth. In 2015, two more carriers have joined the battle to attract customers – United Healthcare and Oscar Health Insurance. Even though the playing field will be more crowded with competitors, most health plans carrying over from 2014 to 2015 will have costlier premiums. The I-Team/ProPublica analysis, which assumes a single 40-year-old seeking health insurance, found 22 of 30 Obamacare plans increased premiums in New Jersey between 2014 and 2015. Five other plans could not be considered because they were discontinued for 2015. Despite pricing pressure from the two newer insurance carriers, some of last year's plans are charging over $60 per month more in premiums than they did last year. For example, a 40-year-old single person enrolled in the "AmeriHealth NJ Premium Regional Preferred Silver EPO" plan will pay $67 more in premiums in 2015, rising from $418 to $485 a month. That amounts to a 16 percent increase. According to a study by the Commonwealth Fund, a think tank dedicated to promoting a high performing health care system, premiums rose, on average, about 6 percent a year in New Jersey between 2003 and 2011.
premiums are impacted mostly by the cost of medical treatment, not competitive pressures from other insurers. "Consumers need to look at more than the premium price when shopping for a health insurance plan," Munoz said. "To lower premiums, some insurers may exclude certain doctors or hospitals. AmeriHealth New Jersey offers the largest provider network in the state of New Jersey." This month, the US Department of Health and Human Resources released an analysis concluding that the "Affordable Care Act is working to enhance competition, expand choice and promote affordability among Marketplace health insurance plans in 2015." Despite a majority of New Jersey plans increasing premiums, the federal research showed, on average, 7 out of 10 Obamacare enrollees could find a cheaper premium in 2015 for roughly the same coverage level they had in 2014. Only eight New Jersey Obamacare plans actually reduced their monthly premiums for 2015, and many of those cheaper plans have compensated by steeply raising out-of-pocket charges for things like medications and emergency room visits. Premiums for the "Health Republic Prime Silver" plan, for example, will be cheaper by $74 a month in 2015, but the plan shifts lots of emergency room costs to the customer. Last year, a Prime Silver patient would have paid a $200 share of a $1000 emergency room bill. In 2015, the same ER visit will cost the patient $500. A spokesman for the company said the increase was strategic. Nationwide, about 13 percent of Obamacare plans have scaled back coverage for ER visits. That compares with about 26 percent of New Jersey plans reducing ER coverage. 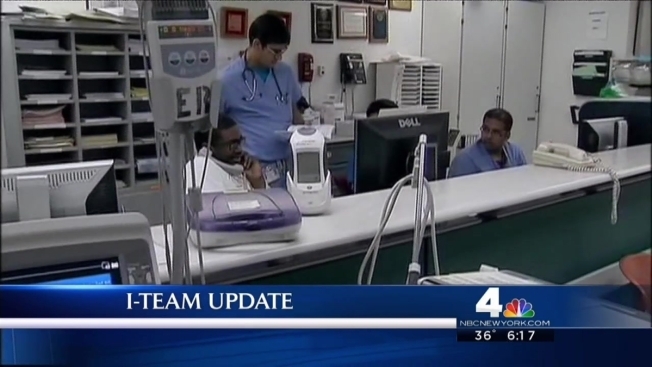 This summer, the I-Team reported on the proliferation of for-profit hospitals charging unusually high emergency room fees in New Jersey. In one case a Bayonne resident and his insurance company were billed almost $9000 for the treatment of a minor finger cut that didn’t require stitches. It is not clear if expensive ER visits like that are driving Obamacare plans to shift ER costs to patients in New Jersey. Charles Ornstein, ProPublica Senior Health Reporter, said it makes sense that designers of some of the first Obamacare plans would feel emboldened to raise premiums and out-of-pocket charges. After all, they have the advantage of a customer base that's been established for 12 months. “Health insurance plans that have a greater market share may feel more empowered to actually increase their rates more than those that are trying to gain a foothold and that will decrease rates so you see some plans that are increasing their premiums by 20 percent, 15 percent,” Ornstein said. Because of the increased premiums and new out-of-pocket expenses, enrollment counselors who help patients navigate the Affordable Care Act are urging customers to dig into the details and try to find bargains. “I think it makes a big difference. We have different companies now,” said Jennifer Gonzalez, a certified enrollment counselor at the North Hudson Community Health clinic in West New York. She says customers should be thinking about what kinds of health needs they’re likely to have in 2015. If a patient has no chronic conditions and no expectation of needing lots of hospital visits, it might be wise to choose a plan with lower premiums and high out-of-pocket expenses. If a patient regularly goes for medical treatment or takes a lot of prescription drugs, it may be better to choose a higher premium and lower out-of-pocket costs. The key, Ornstein says, is not to assume your current Obamacare plan will look the same in 2015 as it did in 2014.